11/14/14: Bubble soccer ("boblefotball") originated in Norway in 2011 and has finally made its way to Vermont. Quite simply, it involves players strapping themselves into 5 foot wide inflated spheres and attempting to score soccer goals without rolling over too many times. 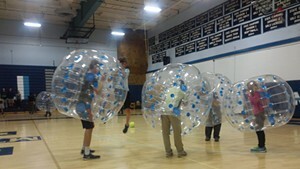 Eva attended a match organized by David Alofsin and Vermont Bubble Soccer at Mount Mansfield Union High School in Jericho with Seven Days staff writer Ethan de Seife for an epic battle of the balls. Music: Barbacoa, "Hang Em High School," "Hammerhead," "Taco Bell's Canon"